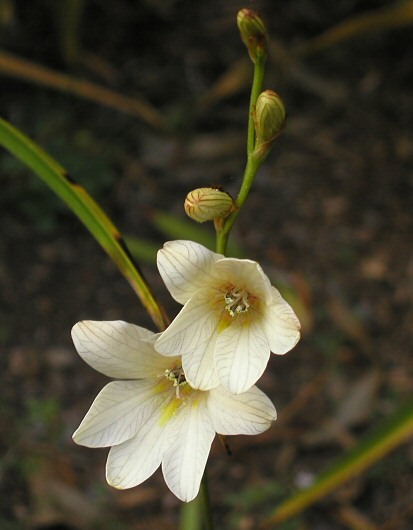 Tritonia is a cormous genus in the Iridaceae family from southern Africa. 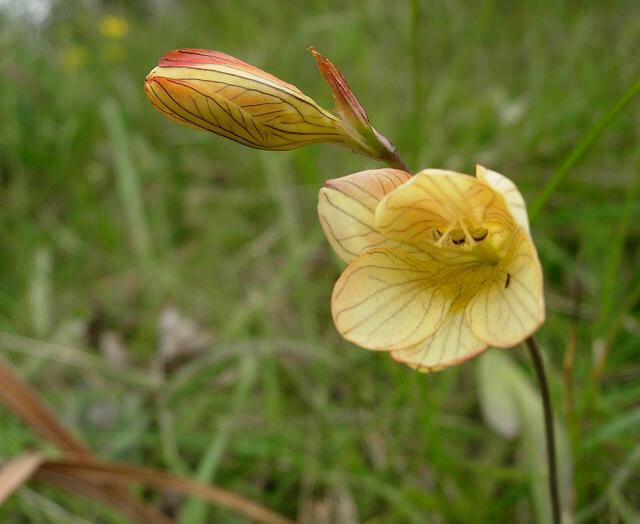 Most of them are in the winter rainfall regions or areas with some rain year round, but there are summer rainfall species too. 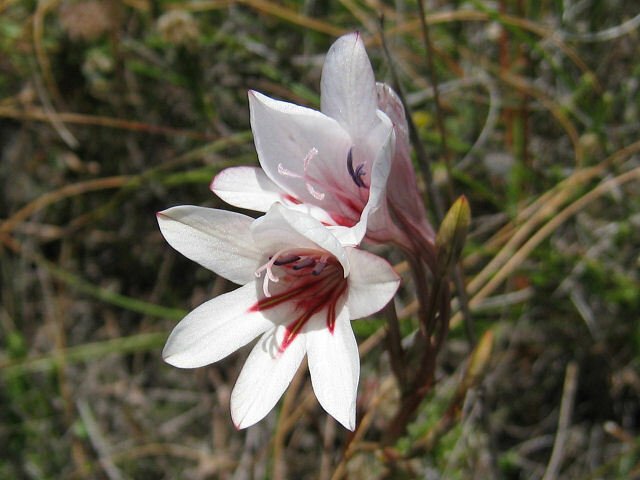 They occur in a variety of habitats: grassland in summer rainfall areas, renosterveld, karroid scrub, and fynbos in winter rainfall areas. 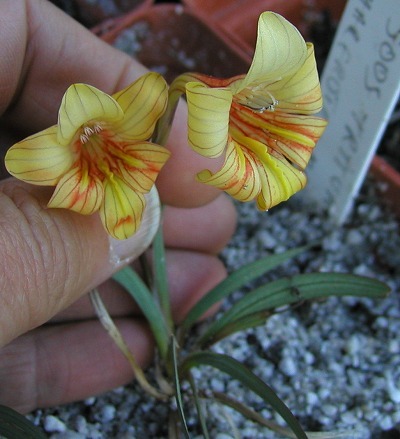 Tritonia species F-K are found on this page. 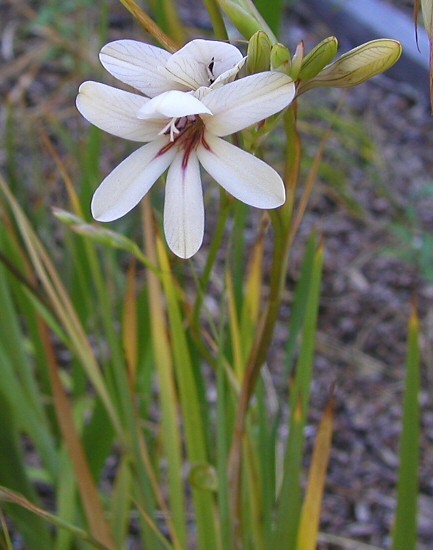 Tritonia flabellifolia (D.Delaroche) G.J.Lewis is one of the last species from the winter rainfall areas that blooms in my garden, usually late spring or early summer. 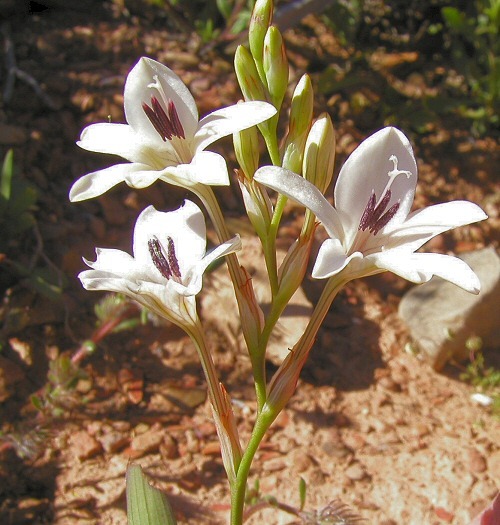 This species is found on rocky sandstone and shale slopes in renosterveld or fynbos and has cream flowers with red streaks or red-outlined stripes on the lower tepals. 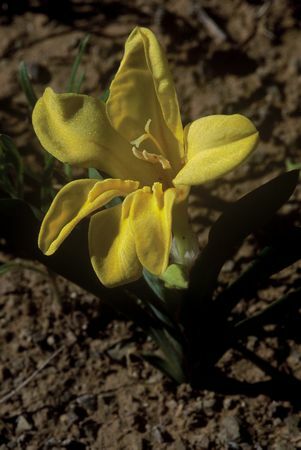 The first two photos by Mary Sue Ittner are of cultivated plants. 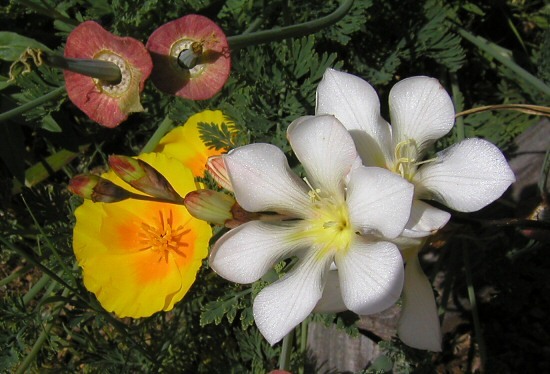 The last two taken by Bob Rutemoeller are of plants seen blooming in the Little Karoo in the Montagu garden in September 2003 in a year with above average rainfall. Photos taken by Cameron McMaster near Napier in the Overberg. 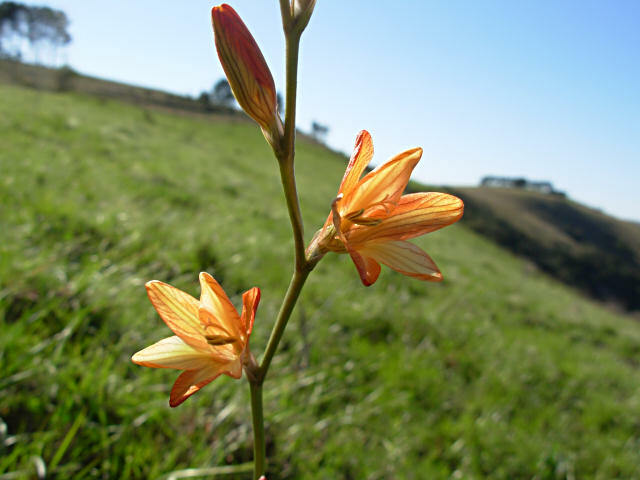 Tritonia florentiae (Marloth) Goldblatt is the earliest flowering Tritonia from the winter rainfall area of South Africa. 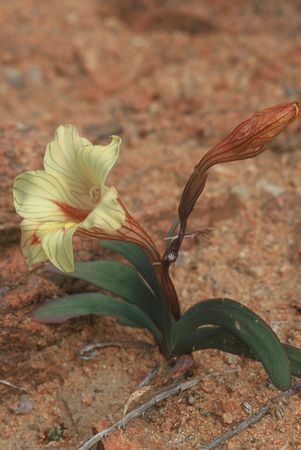 It grows on dry stony flats in the Tanqua Karoo and blooms from the end of May to early September. 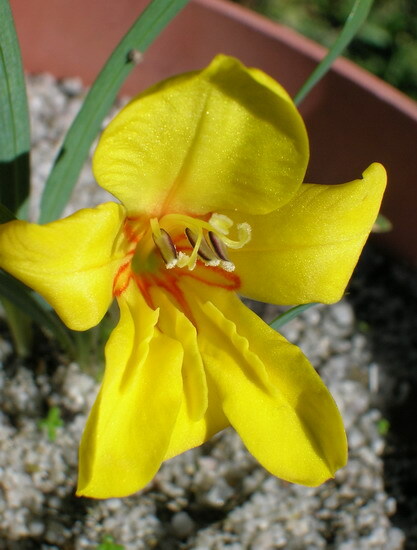 It grows from 7 to 12 cm high and has a few bright yellow flowers in a crowed spike. The first two photos by Alan Horstmann and the last from Rachel Saunders. 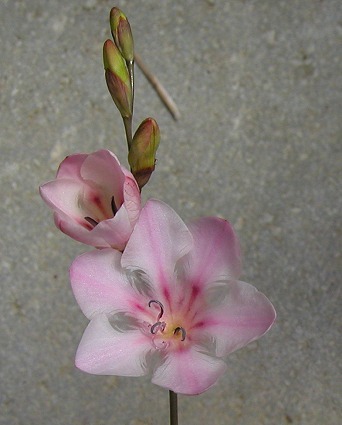 Tritonia gladiolaris (Lam.) Goldblatt & J.C.Manning, syn. 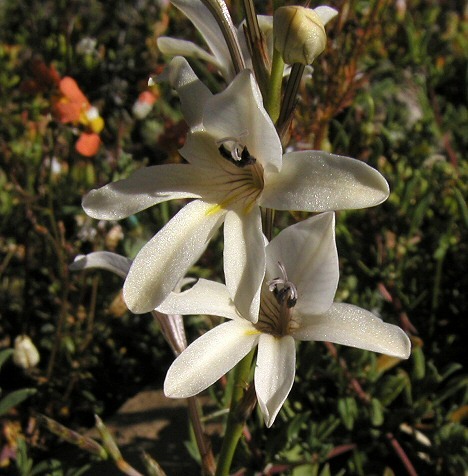 Tritonia lineata (Salisb.) 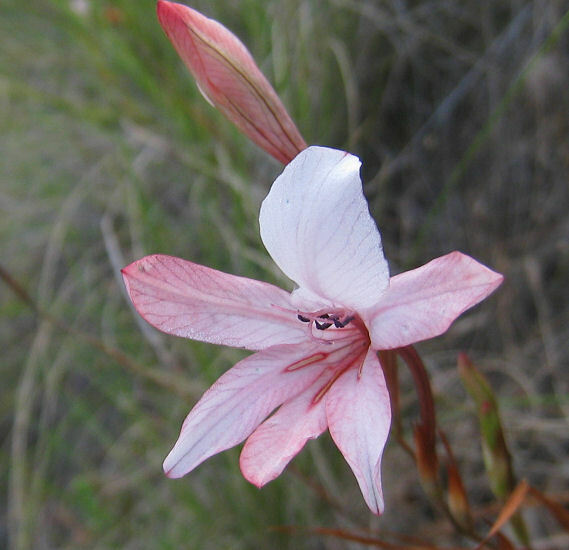 Ker Gawl., grows in grassland in the southeastern Cape. 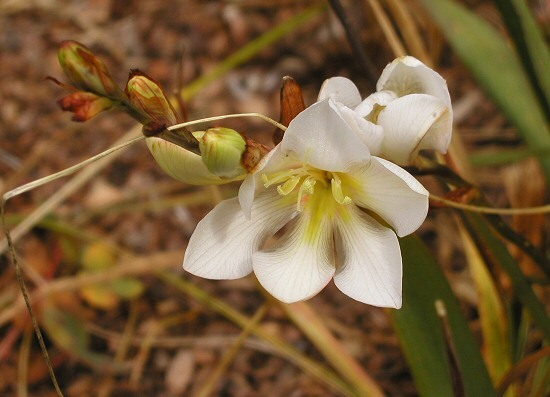 It has creamy white or pale yellow or orange funnel shaped flowers with dark veins. 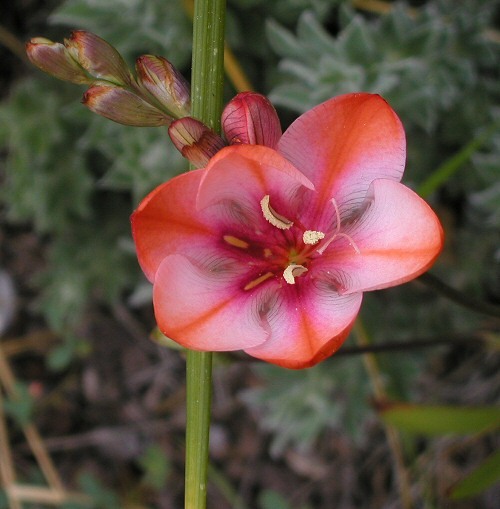 This plants copes with a Mediterranean growing cycle even though it is a summer rainfall species, but I wouldn't say it thrives. 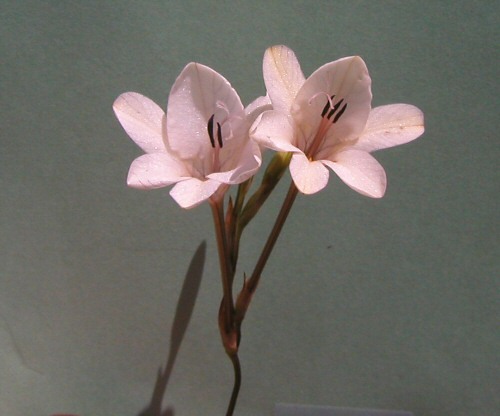 When grown with regular summer water it expands rapidly. 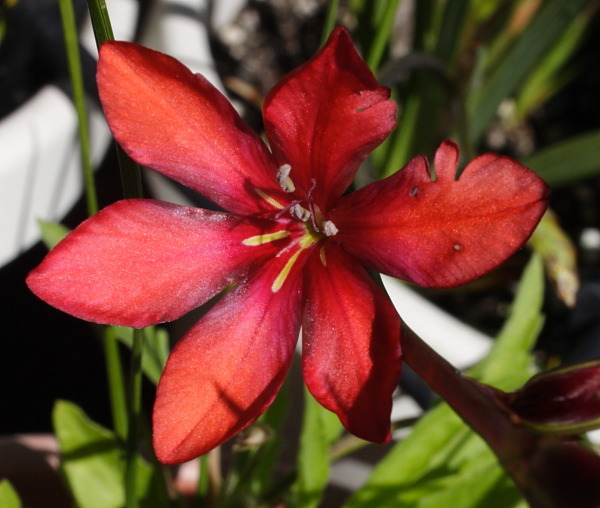 When grown with a dry summer it merely survives. The first photo was taken by Mary Sue Ittner. The last three were taken in habitat in the Eastern Cape by Cameron McMaster. 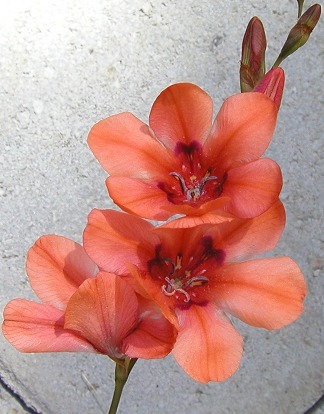 Tritonia hybrids -- The plants picture below were grown from Kirstenbosch National Botanical Garden seed labeled Tritonia, mixed colors. Photos by Mary Sue Ittner. 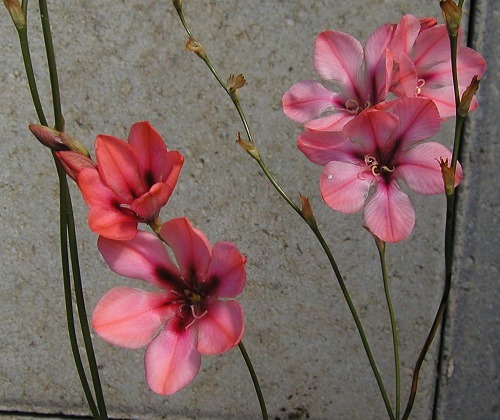 Tritonia 'Night Dancer' is a selection of unknown origin, sometimes available in the California nursery trade. 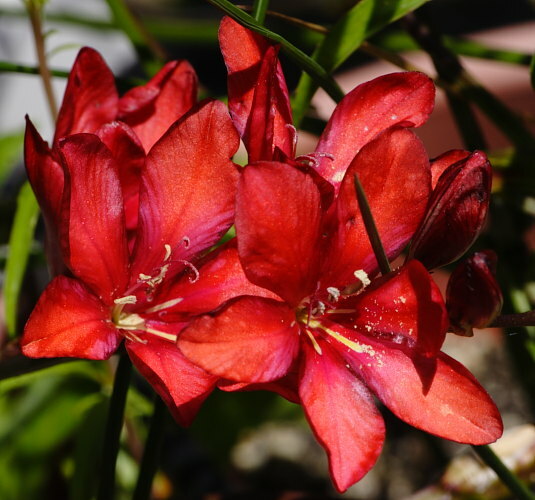 It has intense dark red flowers with orange overtones, grows easily in pots, and offsets well. Photos by Michael Mace. 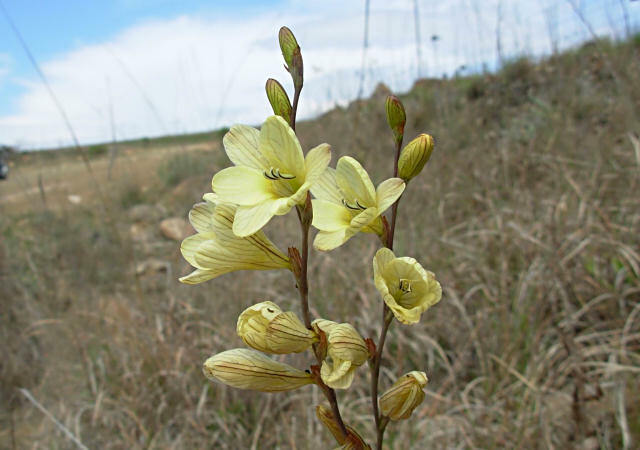 Tritonia karooica M.P.de Vos is a spring flowering plant from dry stony clay flats in the Roggeveld and the Karoo. 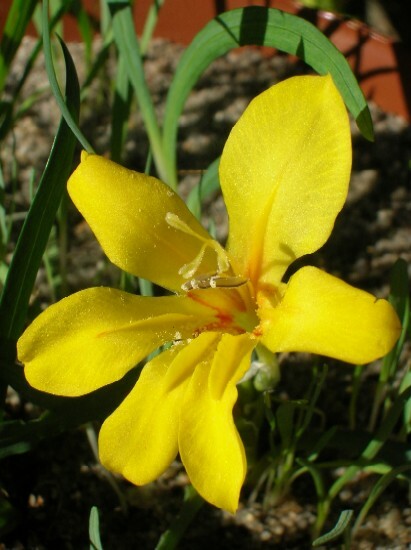 It has yellow flowers flushed with orange. 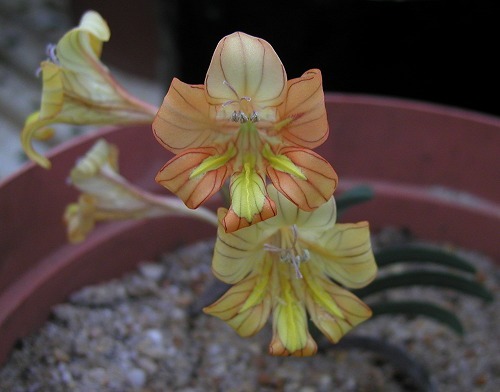 The first two pictures taken by Bob Rutemoeller show plants grown by Jim Holmes and Henry Pauw in South Africa blooming September 2003. 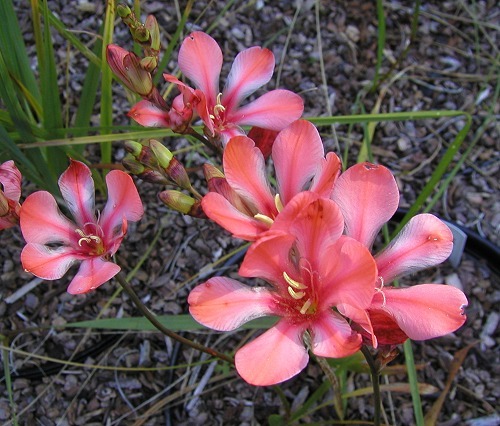 The second two are habitat pictures taken early morning in September 2006 near Middelpos in the Roggeveld by Bob Rutemoeller and Mary Sue Ittner. The last photo was taken by Rod Saunders.